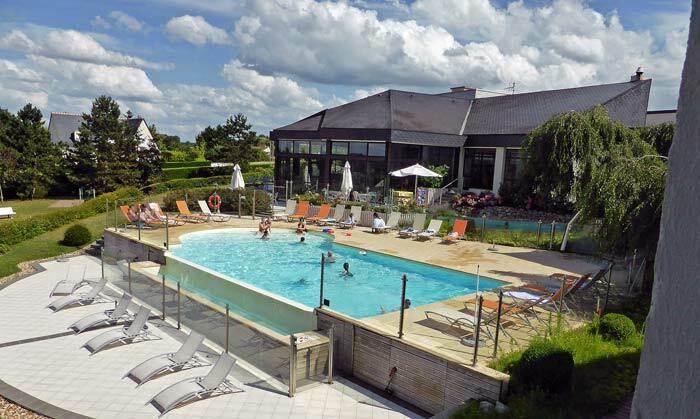 The Novotel Amboise is a comfortable mid-scale four-star hotel with swimming pool and rooms sleeping up to four. 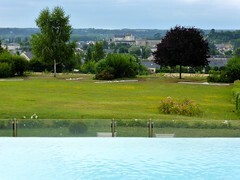 The Novotel Amboise is a modern hotel in the southern residential suburbs of Amboise with beautiful views of the chateau. The comfortable bedrooms with air-conditioning can sleep families of up to four. The hotel has a pool, mini golf, tennis courts, and table tennis in its huge garden. Free parking and a quiet location near main roads make the Novotel Amboise ideal for exploring chateaux in the Loire and Cher valleys. The Novotel Amboise is a fairly new hotel with a more interesting architecture than the rectangular Novotel boxes that are often located near light industrial zones and highways in France. Visually the hotel building is more inviting and more aimed at leisure travelers than the business guests Novotel generally focuses on. The Novotel Amboise is a four-star hotel with full hotel services including a restaurant and bars. 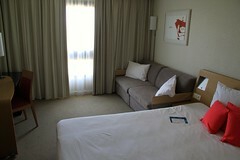 The hotel is thoroughly modern and furnished in the current Novotel style. It may be short on character but not on modern comforts including free wifi. The bedrooms in the Novotel Amboise are modern and comfortably furnished. Up to two children under-16 may share for free the foldout sofa beds when staying with parents. When the sofa bed is folded out, the room gets a bit cramped but it is easy enough to fold back when not in use. As in most Novotel hotels, bedrooms have the bathroom (often with separate walk-in shower) separate from the toilet (unfortunately without an own washing basin). Sufficient toiletries and towels are provided for four. Rooms have a small fridge, kettle with coffee making supplies, and a safe. The closet space at the entrance is huge but other storage space in the room is somewhat limited. The second door between the entrance area (with toilet and closet) and the main bedroom does wonders for reducing noise coming from the passage. Windows can open fully and many bedrooms offer fine views of Chateau d’Amboise. Free wifi is available throughout the hotel but often faster in the lobby area than in bedrooms. 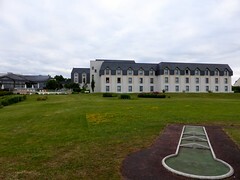 The Novotel Amboise has a huge fenced-in garden (mostly lawn) with a swimming pool, mini golf, table tennis, tennis, and children’s play areas. Indoors, electronic games, board games and books are available. A computer with fast internet connection (and printer) is for guest use in the lobby. The restaurant has huge windows and tables at many levels to give most diners fine views of the old town and Amboise castle. The restaurant serves the standard Novotel menu that changes seasonally but is unfortunately the same in all group hotels in the region. More regional variety could make the hotel restaurant a more interesting option after a full day of sightseeing. The breakfast buffet is well stocked and better than average for a French hotel but less complete than would be expected in for example the UK or US. Breakfast is fair value at €14 for big eaters and a bargain when traveling with children under 16 who eat breakfast for free with parents. 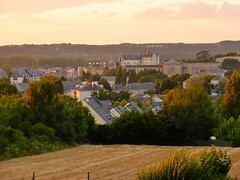 The Novotel Amboise is quietly located in a residential suburb in the south of Amboise. Walking to the old town is possible but the around 2-km hike through a residential area is probably just too far for a comfortable after dinner stroll. The hotel is ideally located for drivers with ample free parking. 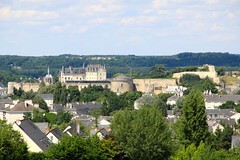 From the hotel, it is easy to get to many other sights in the region without having to travel through the old town area of Amboise, including Loire chateaux such as Chenonceau (15 minutes), Villandry (40 minutes) and less than an hour to Chambord or Valency. 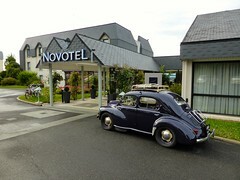 The room rate at the Novotel Amboise is around €100 to €130 per double room. Much better deals, and free breakfast packages, are often available for advance reservations. Novotel Amboise, 17 rue des Sablonnières, 37400 AMBOISE, FRANCE.